괘불이란 절에서 큰 법회나 의식을 행하기 위해 법당 앞뜰에 걸어놓고 예배를 드리는 대형 불교그림을 말하는데 오덕사괘불탱은 꽃가지를 든 석가모니불을 중심으로 아미타불과 약사불, 사천왕상 등의 권속을 함께 그렸다. 오덕사에 있는 이 괘불의 크기는 길이 881㎝, 폭 584㎝로, 석가모니불을 중심으로 아미타불과 약사불의 삼세불, 10대제자, 범천과 제석, 사천왕상, 신중 등을 함께 그린 군도(群圖) 형식이다. 채색은 18세기의 특징인 강렬한 적색에서 벗어나 주홍색을 많이 사용한 것이 특징이며, 금채(金彩)·밝은 녹색·분홍·청색 등의 중간톤이 사용되어 밝은 느낌을 준다. 이 괘불탱은 본존불은 큼직하게 묘사하고, 아미타불과 약사불과 사천왕상은 중간 크기, 상단의 권속들은 아주 작게 묘사하여 구도에 변화를 주었다. 상단은 오색광문 아래 밀집된 권속들로, 하단은 사천왕상만을 배치한 여유있는 구성을 보여주고 있다. 조선 영조 44년(1768년)에 만든 이 괘불은 다소 하체가 길어지긴 했지만 꽃가지를 든 본존불의 형식 및 아미타불과 약사불이 모시고 있는 삼세불의 도상(圖像) 연구에 귀중한 자료로 평가된다. This type of large-sized painting used to be hung in the front courtyard of a temple hall at an open-air sermon session or ritual. This one portrays Shakyamuni Buddha at the center holding a flower twig, flanked by Amitabha Buddha, Medicine Buddha, Four Guardian Kings, etc. The hanging painting measures 881㎝ (L) by 584㎝ (W). The use of crimson color distinguishes it from the Buddhist paintings of the 18th Century, which use deep red. The use of gold powder and secondary colors like green, pink, and blue gives it a sense of brightness. 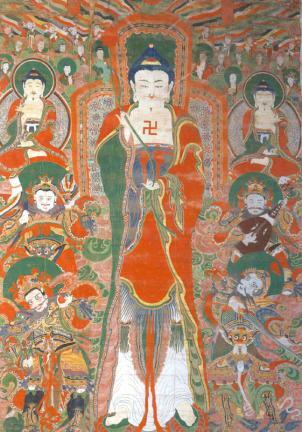 This piece creates a unique atmosphere by making the main Buddha much larger than the others and the attendants (at the top, below five-colored light patterns) much smaller than the others, including Amitabha Buddha, Medicine Buddha, and - Four Guardian Kings (at the bottom). This piece was made in 1768 (the 44th year of King Yeongjo’s reign). The lower half of the body of Shakyamuni Buddha is portrayed as unnaturally long.